To pick up your packet bring a printed or digital copy of your confirmation email with the QR code on it and your ID. If you can’t make it, you can send a friend– just make sure you signed your online waiver and give him/her a copy of your ID and your confirmation email with the QR code on it. Please contact us at littlerock@wickedwinerun.com with any specific question you can’t find the answer to here! A: Yes, lots. Volunteers can help keep our runners happy by helping with registration, water stops, set up and tear down. 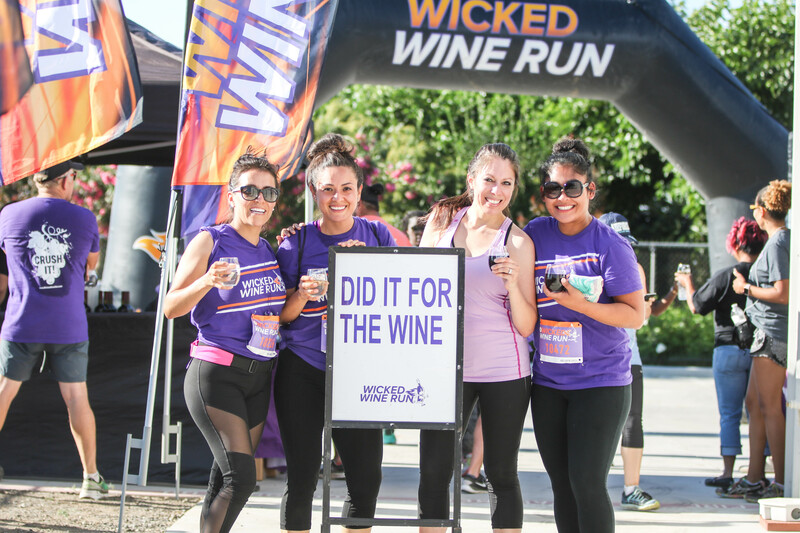 For their selfless service, volunteers get Wicked Wine Run swag, complimentary wine after the event, and a thousand “thank you’s” by the world’s happiest runners. CLICK HERE to register as a volunteer or email littlerock@wickedwinerun.comto get started. A: Wear you running gear or running costume. Bring your I.D., your favorite designated driver, cash for parking (general parking $10), food trucks and more wine. Bring sunblock and water to keep you safe and healthy. We invite you to bring your picnic blanket or pop up chairs to relax after the race while you rock out to the live band. A: Parking is conveniently located on site. Please bring $10 in cash for parking or purchase a $10 parking pass at packet pick up, hang it on your mirror or put it on your dash and drive right through on race day. A: We still run….generally. In the case of heavy rain or thunderstorms we will contact you via the e-mail address you provided and publish information via Facebook and Twitter. To read more about our weather policy click here. Q: What about spectators, kids and pets? A: The event is for adults 21 years old or over. Spectator tickets (21yrs+) are available on-site for $10 and will come with a wristband and commemorative glass (wine is available for purchase). Spectators can purchase food and drink just as long as they bring along a valid ID and have cash or credit card. Kids, infants and pets are not permitted during event hours at the venue.